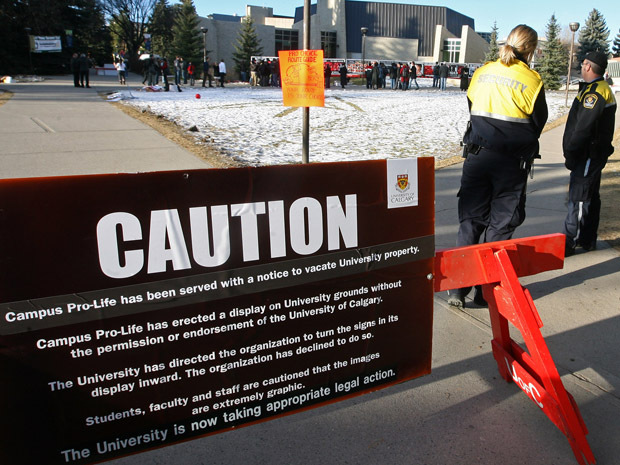 The University of Calgary opposed the Campus Pro-Life protest held on campus grounds. Hutzpah, because the tweet’s author was quondam happy Catholic warrior Michael Coren. I tweeted back: “Has anybody asked how young, vulnerable, often marginalized pro-life students at any Cdn university feel? Remember them?” But that was then, this is now. With his field of vision narrowed by his new social-justice lens, Coren can apparently only see progressive-sanctioned victimhood. In my observation, whatever their experiences off-campus, the least “vulnerable” and “marginalized” people on campuses today — if we are using those words in a systemic sense, as we must, if we are to make group comparisons — are those in the trans community. Their professors, the administration and equity officers are falling over themselves to make life “safe” for them. We saw proof of that in the Maoist “struggle session” Lindsay Shepherd experienced. Her interrogators demonstrated that they consider “transphobia” to be an egregious thoughtcrime. By institutional censorship, she means one or more of: a loss of official status; a failure to gain status; indifference to, or passive encouragement by authorities of disruption or forced cancellation of events; delays in allocating space tantamount to preventing them, or outright refusal; grillings by the student union on “tabling” content or anticipated presentation (demands not made on other groups); allocation of difficult-to-access locations for events; and passivity in the face of mockery, ridicule and even downright bullying of pro-life advocates at their events. Without SFUO status, students cannot reserve space or access resources available to other clubs. So recognition of club status is crucial to their activism. Apprised of the situation, the Justice Centre for Constitutional Freedoms (JCCF), on whose board I sit, sent a letter to the SFUO stating that the SFUO’s discriminatory decision “violates the principals of natural justice, SFUO’s own Constitution and policies, and the fundamental Canadian values of freedom of expression and association, which are crucially important at academic institutions.” The letter urged reinstatement of SFL’s official status no later than Nov 3. Instead, on Nov. 5, the SFUO passed a motion declaring they are a pro-choice organization, giving themselves moral licence to deny status to SFL (they also declared themselves a pro-Palestinian organization, which gave them licence to deny status to Jewish clubs like Hillel, an aside here meant only to illustrate the simple undemocratic tactic by which any politically incorrect opinion can be officially demonized). We’ve been here many times before. Student unions/federations are considered to be independent of the universities in whose bosom they reside. They can do what they like without consequence, because obligatory fees are levied to support them. Pro-lifers are therefore in the classic colonial position of being taxed without representation. The SFUO and its ilk elsewhere are, literally, despots. Well said! I look forward to a subsequent editorial championing the right of pro-life clubs to express their opinion on university campuses without fear of censure or obstruction.